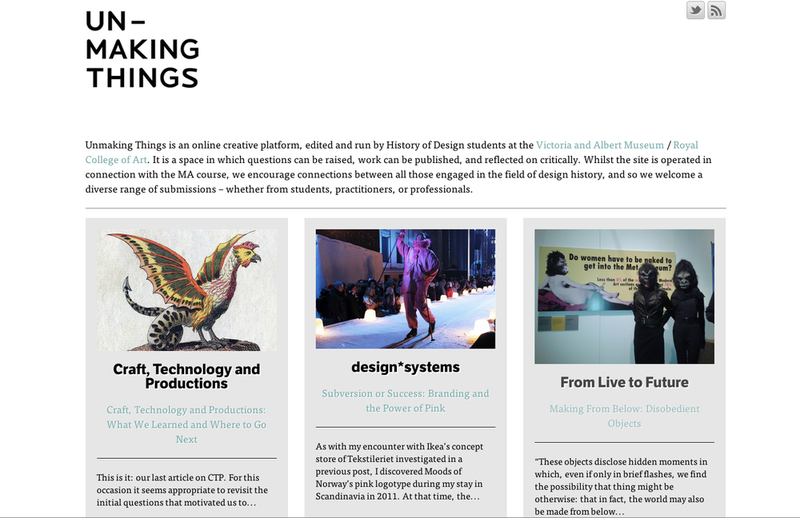 There is something very exciting about the Victoria and Albert Museum and Royal College of Art and it is not some new exhibition or conference, book to be published or otherwise, there is a jewel of a website by the History of Design MA students named Unmaking Things. The freshness that radiates from the various columns counters the heavy academic hand that one might expect from students deeply entrenched in theory and criticism. Instead, it reflects the interdisciplinary crossroads more present than ever in the thinking or rather re-thinking of design history and collects a wide community of contributors. The students pass on their editorial roles as they matriculate and complete their dissertations in no doubt spurred by the experimental and open audience gained by the facilities of the online platform. It feels a bit like the pulse of thinking. Design, craft, art, tradition and technology collide and ferment into the nine columns of content; Craft, Technology & Productions; design*systems; From Live to Future; Materiality / Immateriality; Material Matter- Material Cultures of Science and Medicine; Object of the Week; Objects in Translation; Taking Fashion Seriously and lastly The Cabinet of Culinary Curiosities. Each column has it's own editors with new articles posted weekly. Mental Image: The Software Craftsman, Drawing © Caterina Tiezzi, 2014. A recent favorite in the Craft, Technology and Productions column written by Caterina Tiezzi titled, "Software Craftsmanship: Another Example of Craftwashing or Not?" is a wonderful example of explaining ideas outside of a vacuum. Design takes Craft's hand and with unabashed deft chemistry of words and cited ideas, Tiezzi presents compelling connections and takes to task assumptions either held internally by the reader or in the various camps of thought she is addressing. Knotwe reached out to Annie Thwaite and Charlotte Flint, the Editors-in-Chief of Unmaking Things to learn more about the collective laboratory of ideas and projects being worked on this year. Q: One of the things I love about reading the various articles on Unmaking Things is that from the minute you come onto the website and see the different headlines, there is an energy and freshness to the analysis and inherent query that is exciting. How do you guys cultivate the energy that is in Unmaking Things? And in regard to looking at the history of design? Annie: We’re very lucky to have coursemates with really broad and varied academic interests. We have three streams on the V&A/RCA History of Design course – Renaissance & Early Modern, Asian, and Modern/Contemporary, which means that although everyone’s specialisms are different, they all connect wonderfully into the broader context of design history. For example, our cohort have studied topics from the design of women in contemporary North Korea, to the mediation of X-Ray in nineteenth century England, to the material culture surrounding falconry in early modern Europe. The energy comes naturally from the inherent diversity of the students’ interests, and I think the external contributors that write for Unmaking Things feel it easy to fit their interests in because of this. Q: Can you describe the trajectory of Unmaking Things as it was originally started in 2011 and then restarted in 2012? Annie: Unmaking Things was initially established two years ago by the second year MA students on our course. They wanted a space in which design history could be discussed, in which they could test out ideas, and start debates. When they graduated, the next cohort of second year students expressed an interest to take over their site, and so the tradition began. Each year the new group of second years adapt Unmaking Things to their interests, and the previous years site is archived so it can still be visited. Meanwhile, the Unmaking Things network on social media just keeps growing! I feel really lucky to have been a part of it during my time on the History of Design MA course. Q: Lastly, Knotwe is concentrated on fibers and textiles as it mixes around in craft, design, art, technology and tradition. What are your thoughts on the history of textiles, fashion etc. and the future? Annie: Whilst my research interests don’t particularly touch upon the history of textiles and fashion, I’ve been lucky enough to be taught some amazing modules over the course of my BA and MA. As a Renaissance/Early Modern student, it’s fascinating to me how the study of fashion and textiles plays a central role to every culture and time period, and is incredibly accessible even to those with a basic knowledge of history or fashion. Perhaps one of the reasons for this is the incredible survival of objects of textile and dress that stimulate research. One simple object of clothing allows us to analyse its design, the craft and skill used to make it, the culture and tradition to which it belongs, and its aesthetic value, thereby sparking all kinds of interesting discussions and debates. The study of textiles and fashion just keeps on evolving, and what Knotwe is doing seems to be a perfect example of this. Q: Do you feel that the craft and technology discussion is still unsettled in the sense that there are some camps that still see these as opposing entities? What are your impressions on how digital technologies play into the history and future of design and craft? Charlotte: Caterina Tiezzi, one of the column editors of Craft, Technology and Production has recently written a fascinating article called ‘Software Craftsmanship: Another Example of Craftwashing or Not?’ which explores these fascinating questions further. This idea of craftwashing refers to the superficial use of craft ideas and craft aesthetics and the traditional notion of the craftsman as being at odds with contemporary forms of technology such as Software Craftsmanship. Personally, I believe that digital technologies have the potential to transform and alter craft in an exciting manner and additionally raise wider questions concerning the histories of design and craft. Q: Can you describe some of the projects that Unmaking Things are currently engaged in? And the current projects of some of the previous contributors/editors? Charlotte: Over the past year we have worked collaboratively with Georgia Cherry and Elizabeth Coulson who organised ‘Death by Slideshow’, a mini lecture series at the Royal College of Art. ‘Death by Slideshow’ was advertised on Unmaking Things and our Twitter page in order to raise awareness about the series, which explored new research in design history. Whilst acting as co Editor-in-Chief of Unmaking Things, I have also been working as a research volunteer for a project at the Victoria & Albert Museum that uses oral histories to explore the history of the V&A and the museum’s collections. Q: Who would be Unmaking Things dream contributor? Person(s) from past, present or future? Charlotte: It’s difficult to pick one dream contributor, as Unmaking Things examines such a wide range of topics from past, present and future! For me, one of my dream contributors would be Paoloa Antonelli, the current senior curator of architecture and design at the Museum of Modern Art in New York. Antonelli has recently established a blog called Design and Violence that explores the histories of objects such as handcuffs and the influence these things have upon our lives. Q: Unmaking Things has the following column categories: Craft, Technology, and Productions; Design Systems; From Live to Future; Materiality/ Immateriality; Material Matter; Object of the Week; Objects in Translation; Taking Fashion Seriously and The Cabinet of Culinary Curiosities. These are terrific headings that encapsulate a large number of trends and contemporary issues in design history. I am particularly fond of the Craft, Technology and Productions column. How do you imagine these changing and evolving not only in the academic setting of the V&A and Royal College of Art, but also the design & craft industry? Annie: As a new cohort take over Unmaking Things each academic year, it allows the influences and interests of the new students to filter over into the new columns. This year the columns took inspiration both from individual academic research, and also from those of previous years. For example, this years ‘Objects In Translation’ column, edited by Hannah Lee, was originally influenced by a column of the same name on the 2012 version of Unmaking Things. (See http://blog.rca.ac.uk/unmakingthings/category/objectsintranslation/ for the 2012 link.) The articles written on Unmaking Things allow editors and contributors to test out ideas they have – whether more academic theories, or more practical design-based thoughts. In this sense, even after we have given over Unmaking Things to the next year-group, I think it will have given us the experience we need to develop our ideas both in an academic setting and in the industry, through sparking responses and conversations with people on social media, and so on.